The man in question is Sergeant Joseph Dore, Company C, Seventh New York State Militia. I, for one, applaud the Virginia Flaggers in their new initiative to celebrate the sacrifice, courage, and honor of U.S. soldiers who fought to preserve the soul of the nation and Union, and crush the wickedness of rebellion. I’m sure this will be the first of many similar posts by the Virginia Flaggers to come. OK–what is going on . . . ? And you all, sir, are pathetic whiners. You have a Dixie Day, David. Great article, Mike. I’ve already shared that with others since you posted it. Thank you! The heritage folks have a way of, say, not doing due diligence when it comes to posting images that they think makes their point. One time someone posted a long, turgid paean to the virtues of traditional southern womanhood, and illustrated it with a picture of Lucretia Mott. They should’ve used a picture of Angelina Grimke Weld. She was from a Charleston, SC family. Born there and grew up there, too. I was afraid of that. However, my 7-month-old grandson is a Dore and lives in Louisiana–we are gonna get some fun out of this one! I guess if they can all get confused at First Bull Run, I might excuse this one–MIGHT! This is like the alleged ‘Black Confederates” photo that turned out to be a total fraud. Fortunately, it looked familiar to some people who saw it online and realized the ‘proof’ was, in fact, anything but. It was the iconic photo of the Louisiana Native Guards with the image on the end of the photo of their (white) officer (who is wearing what is clearly a Union blue uniform) cropped off. Awesome…proof positive that don’t have a clue. Oh, I’m sure this was an intentional salute to U.S. troops who volunteered to suppress the rebellion. 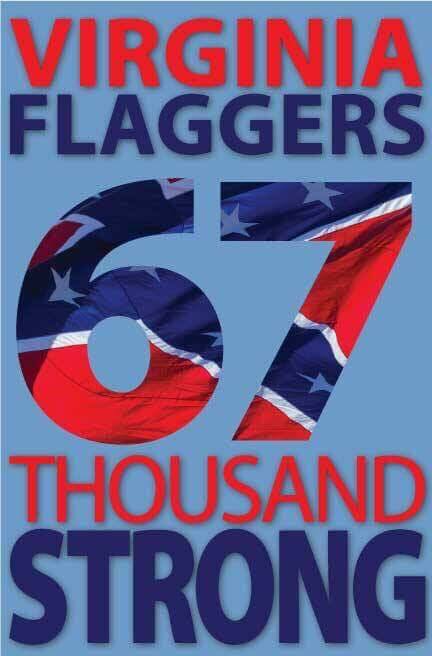 After all, the Virginia Flaggers are “67 THOUSAND STRONG,” so it’s practically inconceivable that this is just an ignorant fnck-up, right? Right? We honor all who fought, confederate or union. These guys went thrue hell in the war of northern aggression. All so Mr, Lincoln could collect his Taxes. When you say “we,” are you speaking for the Virginia Flaggers? It would have been a hard thing to sell to the American people that the Civil War was about taxes. Or for the secessionists to explain to the people in the South and in the North that they were seceding over taxes. The secessionists stated quite a few times that they were seceding over the issue of slavery, specifically its expansion into the western territories which Lincoln opposed. They were quite emphatic about that. Lincoln never said the war was so the United States of America could collect taxes probably because the federal government had no direct taxation in place or was attempting to put one in place in 1860/61. Now, the federal government did put in a direct tax as the result of the Civil War in 1862. That is a plain and obvious fact. However, that direct tax was only created because of the war itself. No war, no direct tax at that time. Since an income tax was desired years later as we know from studying history and an amendment passed to allow it, the question now is would an income tax have happened had there been no Civil War? The whole answer is subjective as we will never know. No Donnie, this is a failure to know what they are looking at historically and posting. This is not the first time they failed to do their research. Good for you, Andy! It appears that you have a bi-partisan readership. The content here at Dead is interesting, entertaining, and fact based — a new concept for some.